After reading numerous manga series and a few comic books till now, I already have certain in-built expectations about these forms of visual storytelling regarding structure and style. However, Aya: Life in Yop City almost breaks down those expectations. This graphic novel is a breath of fresh air. The graphic novel is about everyday life in Yop City. A “splice-of life”, you could say, that mostly centers on the ambitious character Aya and her friends, Bintou and Adjoua. On the surface it may seem like a soap opera that revolves on relationships, money, and infidelity but it implicitly presents the themes of feminism, gender-based expectations, homosexuality, and much more. The artist, Clément Oubrerie, has a unique style that challenges my expectations of published illustrations. I’ve internalized that the final drawing should consist of finely inked lines and wondrous, eye-appealing, details. However, the artist of Aya, has re-opened my eyes to the fact that illustration falls on a spectrum ranging from the finely detailed to stick figures (I guess). In Aya: Life in Yop City, it looks like beautiful colored sketches outlined with ink. I absolutely adore it! This graphic novel has an easy-going, comical nature. I recommend reading it after a hard day, if you are feeling down, or you are in the mood for a funny book. 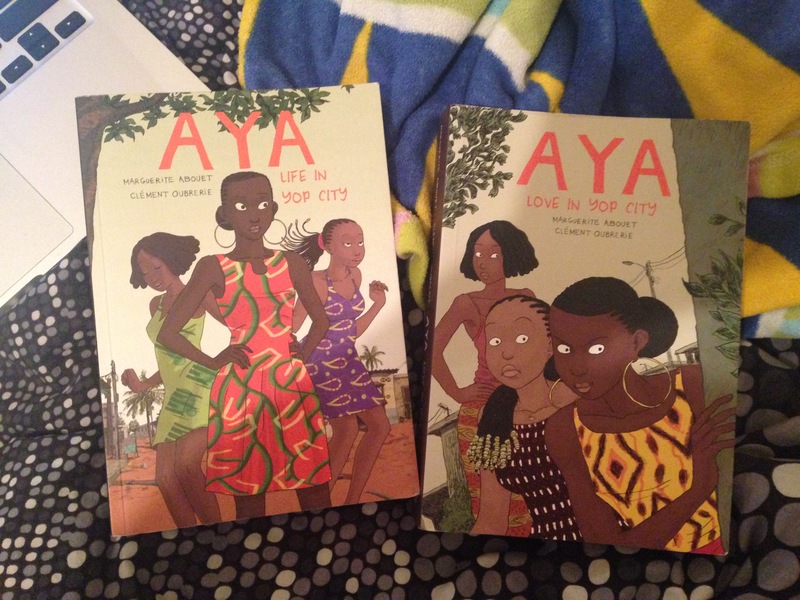 Time to read Aya: Love in Yop City. May you all have a wonderful holiday!